Net metering is the policy that allows people with solar to get a credit on their electric bill for the energy they produce from their system. Minnesota Statute 216B.164 establishes the rules of net metering in Minnesota. Customers of any public utility, municipal utility, and rural electric coops may net meter, however the rules of net metering differ depending on your electricity provider. For public utilities, eligible systems are sized 1 MW in capacity or less, and for municipal utilities, eligible systems are sized to 40 kW or less. For investor-owned utilities, systems greater than 40 kW in capacity may be limited to generating at most 120 percent of annual electric consumption. There is no cap on total net-metered generation, however a public utility may request that the PUC limit net-metering once net-metered generation has reached four percent of the utility’s annual electricity sales. Utility customers with net metered systems will be credited for each kilowatt produced by their system and each month will be billed for the number of kilowatt hours they used, minus the number of kilowatt hours generated. If your generation exceeds your usage for a given month, you will receive a credit for each excess kilowatt hour, to be applied in later months when you generate less electricity than you consume. Municipal utilities and electric coops may charge net metered customers additional fees to recover any associated fixed costs. Compensation for excess generation can depend on which type of electricity provider you use and the size of your system. For all systems 40 kW in capacity or below, compensation is at the average annual retail electricity rate. For systems between 40 kW and 1 MW, compensation is at the public utility’s avoided cost rate. Alternatively, any customer can request to be compensated in the form of a per-kilowatt-hour credit, which carries over month to month. At the end of the year, customers of public utilities will be compensated at the avoided-cost rate and customers of municipal utilities and electric coops will have their credits expire. Aggregate net metering: Public utilities are required to offer aggregate net metering to customers. All meters involved must be on contiguous property and owned by the same property owner. 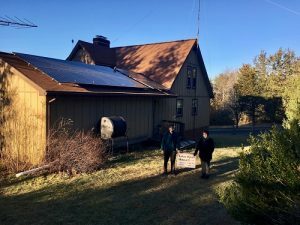 Read about community solar in Minnesota. If you’re having trouble with net metering and need help, post to the Solar United Neighbors of Minnesota listerv. Submit a comment to the PUC.